I’ve written numerous times over the past oh, I don’t know, few years about the ongoing mobile evolution (revolution?). The ubiquity of mobile devices is empowering consumers, businesses and their partners to more seamlessly communicate and build high-quality, meaningful relationships and transactions. IBM recently introduce a spate of capabilities intended to help organizations bolster their mobile enterprise strategies, which you can read in more detail about in the post below. And it’s important to note, IBM has also been following this story closely, and responding accordingly. And on Friday, the company unveiled a suite of new software and services that enables global organizations to build a comprehensive mobile computing strategy –- from securing and managing devices, to creating mobile applications and analyzing data. 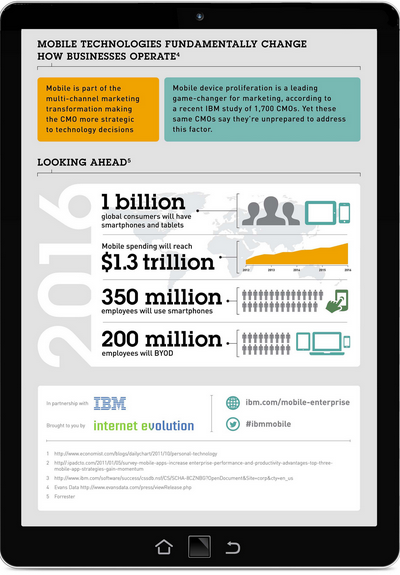 These new offerings are part of a move by IBM to capitalize on the growing market opportunity for mobile that is expected to drive $130B in revenue for the IT industry by 2015, according to a recent study. As organizations increasingly view mobile computing as the next platform to conduct business, the market is evolving beyond just the device. Business leaders including the chief information officers (CIOs) and increasingly chief marketing officers (CMOs) of global organizations such as airlines, retailers, governments and healthcare providers are among the businesses turning to IBM to ensure mobile services and solutions are readily available to constituents and in full compliance with IT strategies. But, they need solutions that can be applied across any mobile environment and device — whether a laptop, smartphone or tablet — and can provide an underlying IT infrastructure that is always available, secure, effectively manages data, and integrates both front and back-end systems. According to latest reports, more than 10 billion mobile devices are expected to be in the hands of consumers, doctors, sales leaders and the like by 2020. While the opportunities presented by mobile are significant, there are a number of challenges facing clients when adopting mobile computing. This includes the management and security of devices and their underlying infrastructures, ensuring a quality mobile application experience for users across operating systems, new devices entering the market almost monthly, integrating data with the cloud, and analyzing insights captured in real-time. IBM offers clients a variety of offerings to quickly adopt mobile technologies throughout the organization, from consulting services to software solutions and industry expertise, organic R&D to key acquisitions. As global organizations struggle to keep pace with the opportunities that mobile computing can provide, IBM’s new suite of capabilities will enable them to overcome these obstacles. Mobile technologies have significant potential to fundamentally change how businesses operate, and should be part of any multi-channel marketing transformation that helps CMOs make more informed business decisions based on this important shift in consumer behavior. Mobile Planning and Strategy Services: Working with IBM consultants, clients can identify gaps and properly plan for the right mobile strategy. IBM has been steadily investing in the mobile space for more than a decade, both organically and through acquisitions, offering a complete portfolio of software and services that delivers enterprise-ready mobility for clients — from IT systems all the way through to mobile devices. This builds on IBM’s deep understanding of its clients and their evolving IT needs. 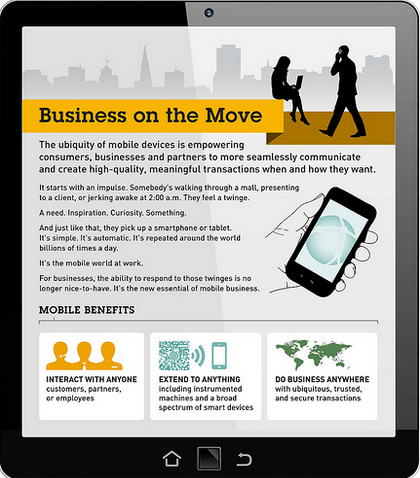 You can go here to learn more about IBM Mobile Enterprise capabilities.